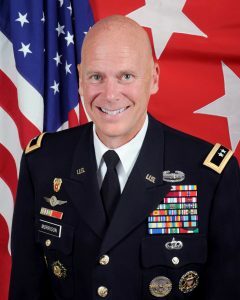 MG John B. Morrison, Jr. assumed his current duties on August 26, 2016, after serving as the Commanding General, United States Army Network Enterprise Technology Command/Deputy Commanding General, Second Army. He entered active duty as a Signal Corps Second Lieutenant in 1986, upon graduation from James Madison University in Virginia. MG Morrison served in command assignments at the battalion and brigade level. He held key staff assignments with the XVIII Airborne Corps, Fort Bragg, North Carolina, the 1st Cavalry Division, Fort Hood, Texas, and at the Pentagon on both Joint and Army Staffs.